Most homeowners’ worst nightmare involves something with the roof of their house. At the end of the day, your home shields you from the elements, and the roof is the most vital part of that protection. If there is an issue with the roof, your home is not doing its job. That is where we at Roofing by Bruce come in. With our years of experience, we can identify any issues that you may have with your roof. With that in mind, let’s take a look at some of the most common roofing problems. A common roofing issue is a leak or any type of moisture. That makes sense – after all, your home is designed to protect you from rain and wind. Most problems with leaks occur in the areas around your vents and pipes. Water in these areas can seep in through small gaps, eventually leading to mold or rot inside your home. Make sure that your roof is properly sealed around edges, ventilation or chimneys and there should be no issues. Flashing that is not installed correctly can cause other issues. For example, improperly installed flashing can also have issues with wind resistance. Ultimately, this can also result in a blow-off if heavy winds can get beneath flashing where roof sections meet – and having your roof fly away isn’t something most homeowners want. If the seams are not sealed correctly, this can also lead to moisture issues. Shrinkage is also an issue. If your roof is not properly sealed, parts of your roof could actually decrease in size in area. In turn, this could lead to deterioration of your roof, notes Buildings.com. On the other hand, blistering is another common issue. If the asphalt used for your roof was brought to an improper temperature, it will cause blistering. This can mean that your roof will age prematurely, leading to an expensive roofing project much sooner than you would like. Obviously, no one wants critters getting into their home. Small animals and insects love wood and will often to get into the wood beneath a roof overhanging – the soffit. For birds, this can become a protected nesting space, while many bug species can make it into a meal. Make sure to look for any cracks, holes or potential rot around your roof edges. Gutters are also prone to water and debris buildup, especially during the fall season. It’s vital to keep gutters cleaned out to ensure proper water flow. 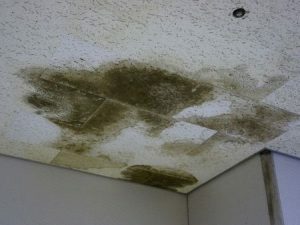 If this is not addressed, this could lead to mold and mildew growth, ice dams, excessive weight on your roof and many other problems. If you think your roof may have one of the aforementioned issues, call Roofing by Bruce today. We will work with you to identify your problem and make recommendations on the best options to resolve your roof’s issue. Learn more or request an estimate today by calling 570-424-7250.